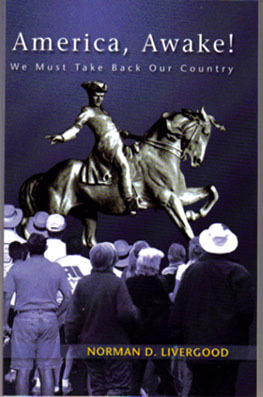 America Awake - We Must Take Back Our Country is Norman D. Livergood's first of several books published with by Dandelion Books. This book is just as timely today as in 2003 when it was published. George W. Bush was President and the country was still recovering from 9/11. “Ruthless corporate, financial, and political looters are rapidly undermining our civil liberties and pushing the middle and lower economic classes into privation, poverty, and homelessness,” writes Livergood. Since the emergence of America, Awake! Livergood has published six additional books with Dandelion. Each of Livergood’s books has progressed from delivering the initial wakeup call to providing conscious solutions. With master’s and doctoral degrees in Philosophy from Yale University, a master’s degree in psychology and a second doctorate in artificial intelligence, Livergood is well-qualified to deliver information that he has evaluated, investigated and put to the test by placing it in proper perspective, historically and philosophically. Added to his academic credentials are those working in the field: in 1993 through 1995, he served as Professor and Chair, Artificial Intelligence, at the United States Army War College. Livergood has carried out extensive research and published in the fields of artificial intelligence, political-economic philosophy, intelligent tutoring systems, and distance learning. Livergood’s comprehensive website material is presented with the intention of providing online readers with a solid information base from which to evaluate the current world situation with understanding and awareness of its complexities. The New Commonwealth is also available on Amazon Kindle.